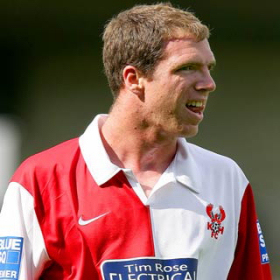 Keith Lowe, just released from the Harriers, has today joined up with local rivals Hereford Utd on a short one year deal. He was one of the many Harriers favourites released a few weeks ago in the major cost cutting exercise that ripped apart the team that finished just outside the play-offs. Keith joined us from Wolves last season and his very first game for us was against the Bulls in a pre-season friendly that we won 1-0. He went on to sign a one year contract with us and became an ever present at right back. Apart from being a solid defender capable of playing at an higher level he could also score some cracking goals. His last one for us came in the draw at Histon in almost the last game of the season when his superb shot from the edge of the area left the crowd stunned with it's perfect execution. In his fifty two games for us he scored four times and was never booked once. We will be welcoming Keith back to Aggborough on July 21st when his new team come here for another pre-season friendly. It goes without saying that Harriers Online wishes Keith all the best at his new club. Shame he had to go there though.